Everton travel to White Hart Lane for a clash of two teams battling to secure fourth place and a spot in next seasons Champions League. As I write this preview Liverpool are 4-0 up against Arsenal, so the prospects for Sunday look likely to be a case of the Blues needing a win to close the gap to the Reds back to just two points. Everton’s recent record against Tottenham is relatively good. For a number of years White Hart Lane was a bogey ground for the Blues, but under the second half of the David Moyes reign, Everton have found life in this part of North London to their liking. In the last seven meetings of the two teams at Spurs, Everton have won three, drawn two and lost two. Last season, despite falling behind to a first minute goal, Everton battled back to lead 2-1, with a fabulous solo goal from Kevin Mirallas putting the Blues in front after Phil Jagielka had equalised. Tottenham refused to concede defeat and a late Sigurdsson goal leveled the game, with each team forced to settle for a point. The reverse fixture at Goodison earlier in the season ended in a disappointing 0-0 draw. Both teams had good chances to win the game, but after a poor first half display Everton were a little fortunate not to suffer defeat. Despite sitting sixth in the league, Tottenham have endured a disappointing season, which has resulted in a change of management midway through the season. The loss of Gareth Bale to Real Madrid has removed the cutting edge from the Spurs line-up and although the club spent over £100m in the summer, they have failed to replace the Welshman. The sacking of Villas-Boas may have come as a surprise to some, but ultimately the Portuguese lost his job due to a lack of goals. Tim Sherwood has taken over the reigns and although he has adopted a positive tactical approach and enjoyed some good results, he hasn’t managed to solve the teams ultimate problem, which is putting the ball in the back of the net. Everton’s injury list is beginning to ease a little. Seamus Coleman is likely to return at right back, and the surprise return of Sylvain Distin in last weeks win over Aston Villa will mean that Martinez is able to select his first choice defence. Romulu Lukaku is still a fortnight away from a return, but Lacina Troare is now in full training, although he isn’t yet fit enough to make his debut in the starting line-up. Instead, Martinez is expected to reward Steven Naismith for his goalscoring form with a starting role in the centre of Everton’s attack. Possible Starting Team: Howard; Baines, Coleman, Jagielka, Distin; Barry, McCarthy, Mirallas; McGeady, Pienaar; Naismith. Since the formation of the Premier League Everton have played Tottenham 43 times, winning only 8, drawing 16 and losing 19. Everton have only lost two away games all season. Tottenham have already lost four times at home this season. Everton have won five, lost two and drawn three of their last ten Premier League matches. Tottenham have won six, lost two and drawn two of their last ten Premier League matches. 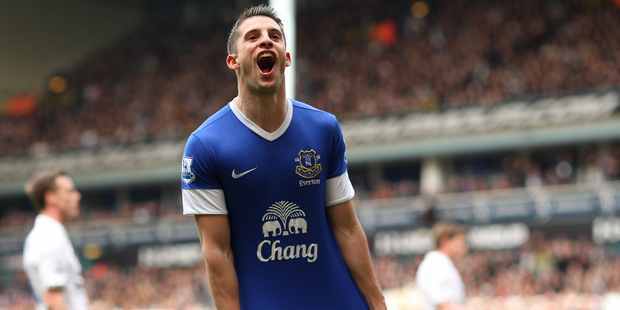 The corresponding fixture last season ended 2-2, with Phil Jagielka and Kevin Mirallas scoring for the Blues. The reverse fixture earlier this season at Goodison Park, ended 0-0. Our archive footage comes from Everton’s most famous win over Tottenham, the 4-1 victory against the Londoners in the 1995 FA Cup semi-final. Previous Post Would the return of Jack Rodwell be good business?